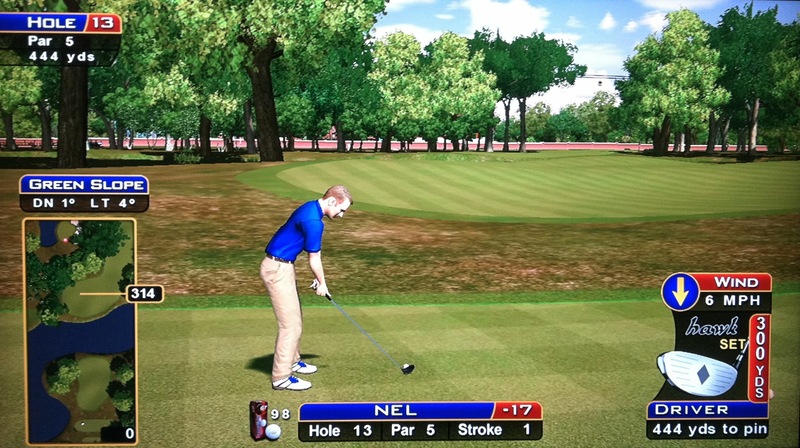 This section breaks down how to play each hole at Golden Tee’s Sunny Wood. 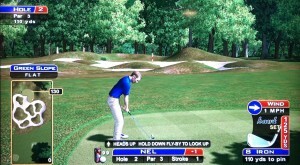 Check back soon to see how this course and specific holes rates difficulty-wise among all the 2009 courses! 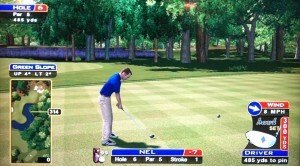 Check back here and learn even more tips and tricks, and how to play from each of the tee boxes on the course! 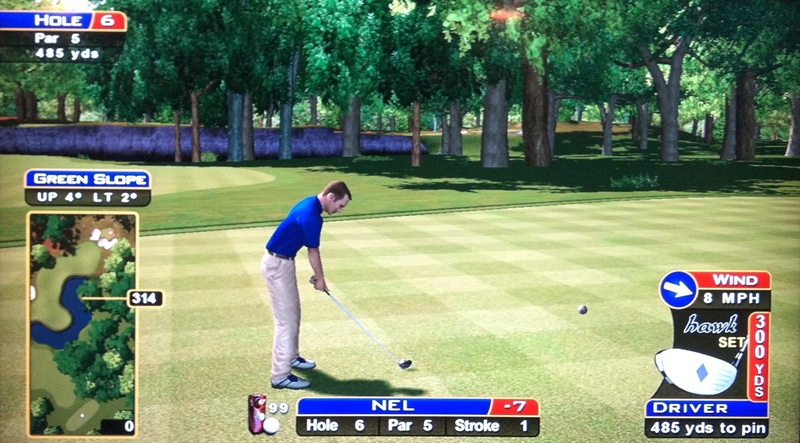 So what’s the best set of clubs to use when playing Golden Tee 2009’s Sunny Wood? Well, I got feedback from 25 pros on their choices, and here’s what I found! The most votes went to the old hybrids that were offered in 2005 Golden Tee. This set has always been a favorite among pros and amateurs, and they play well on this course. If you don’t have this set, the hybrid set sold in 2009 Golden Tee is also a great option! Coming in second is the low-loft clubs, which feature a 310 driver that many players feel comes in handy on a few holes. And, the elevation change is much less on this course. For consistency, some players use the Big Bertha set or the forged clubs, but only because these guys don’t like to change clubs each round. A couple players have also found the 0 Hybrid in the 2007 Hybrid set to help out on 4 or 5 holes, but your best bet is still probably one of the two sets above! Oh, and the D2 balls are the most popular choice, followed closely by the Gamers, and then the Freaks! 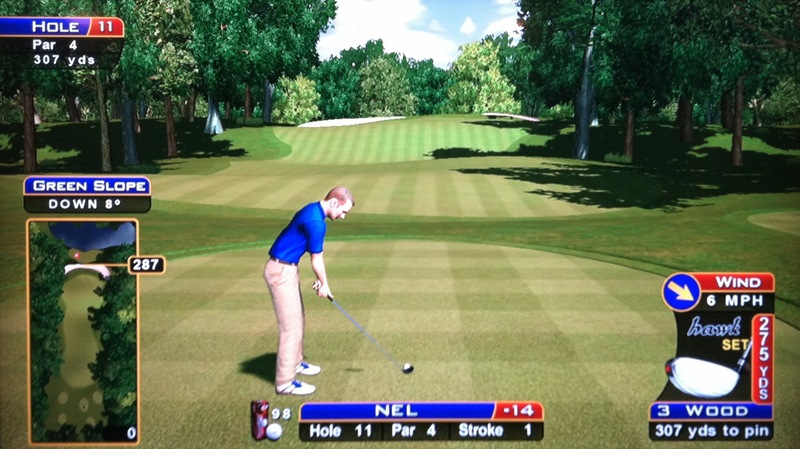 Here’s what the players are saying early on about Golden Tee’s new 2009 course Sunny Wood! AMJ — GT Par is -27. Jeff S — Didn’t shoot too well here either. There are some shortcuts. If you hit right….which I…..did not. You can always cut the corner through the sand and rough with a nice big C3 with roll, but you also don’t want to mess that up and be shooting out of tougher terrain on the first hole! If you get a nice pin placement and are within 100 yards or so, you might be able to practice your “chush” shot here too! You can be on any of 3 tee boxes here and will have some sand to negotiate, but it’s not bad. Err towards the middle of the green if you’re in between clubs! There are two ways to attack this hole, depending on where you’re at on the tee box and your level of comfort with each! 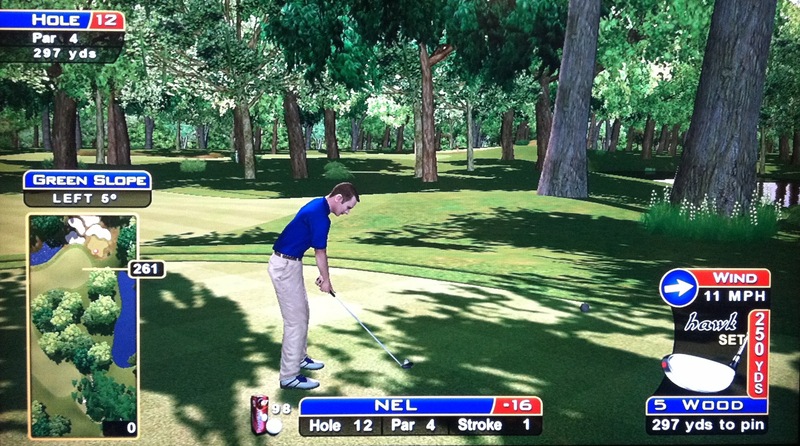 If you’re on the right, your best shot is usually a C3 with backspin around the tree into the green. It can also be a B3 shot if you’re far enough right, which is easier to control. Try to angle in between the traps if possible. Short is better than long, because long is water! 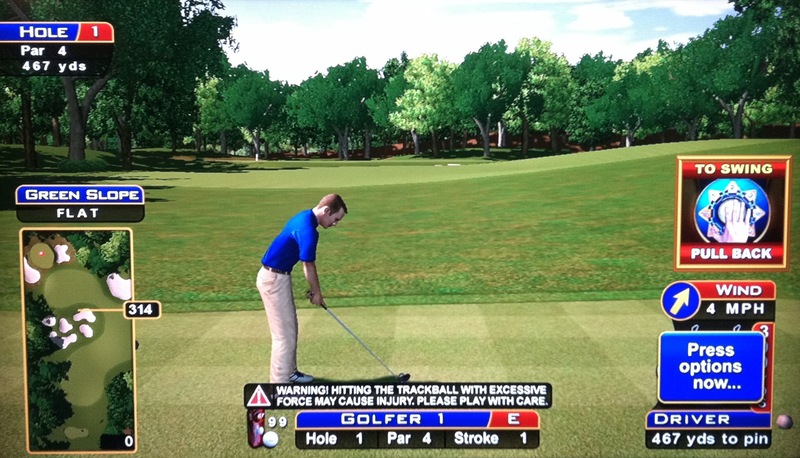 Remember that a full-out C3 will add some distance to your shot, so adjust accordingly if you’re doing it. 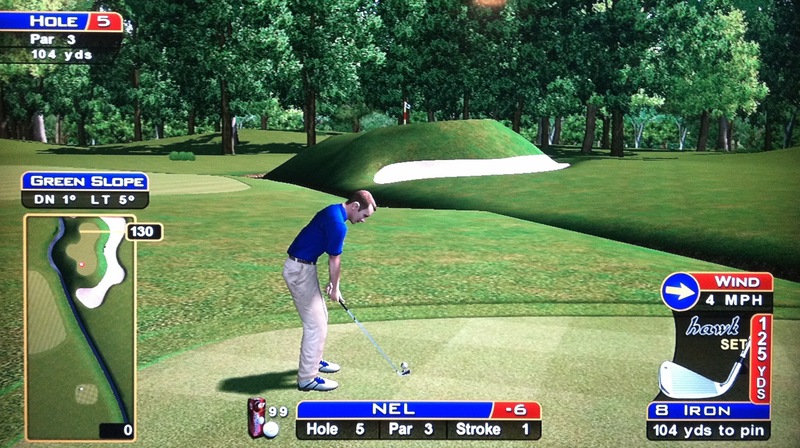 If you’re on the left side of the tee box, line yourself up directly with the flag and take a look. There are some significant gaps in the trees on the hill in front of the green, and it’s not too difficult to navigate through them! Most often you can hit about a 3/4 driver with backspin that will stay low enough under the trees without hitting any leaves, and this should also give you enough distance to hold the green with your backspin. You should definitely be thinking eagle here! Again, don’t assume that your drive will hit the tree leaves and slow down, or you might be long in the water! 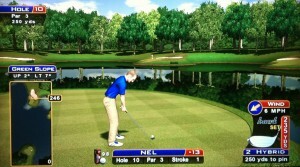 I always play my drive to the middle-left side of the fairway, about even with the middle of the pond on the left. Even if you’re in the middle of the fairway, you’ll be fine, so just don’t get too aggressive with that water off the tee! From this area, you’ll have anything from a 2-iron to a driver, hitting an A1 or B1 into this green. The approach shot is always difficult — you need to be right on with the amount of cut you put on it. I often end up in the rough to the right of the green because I’m scared of not hooking it enough, which would leave it in the water! You don’t necessary want backspin on this shot, especially if the pin is on the right, or else you can leave too long a putt. 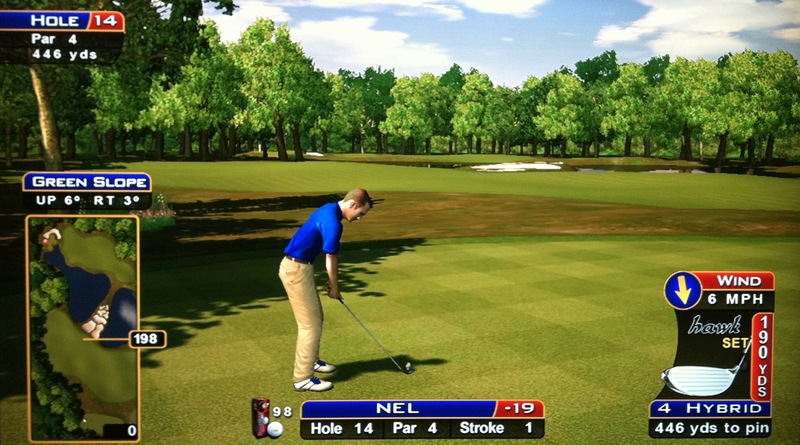 This hole is great to practice your distance and accuracy. If you’re planning a B1 type shot, remember that you might need to pull back a bit towards A if you’re going out towards 1 on the follow-through so that it cuts back enough. 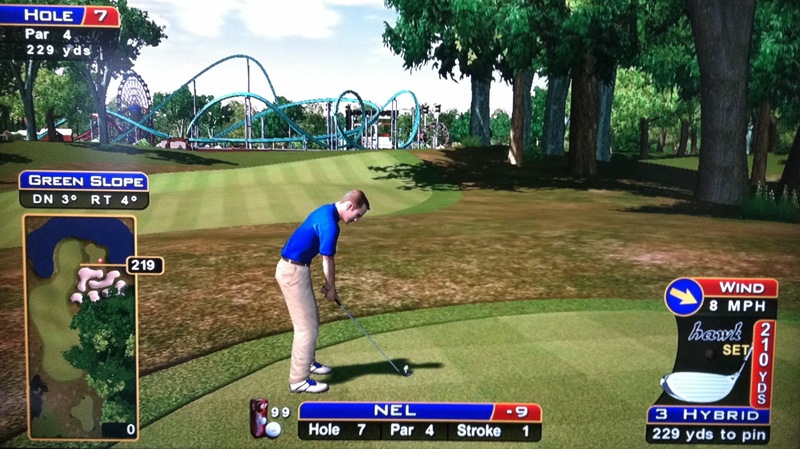 It also appears as if you might be able to play the right side of the fairway, hitting a C3 through the amusement park into the green! 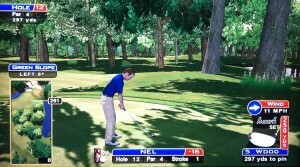 However, that looks too risky, and you can always get to the green going around the left side of the tree anyway! ENJOY THE SCENERY ON THIS ONE! 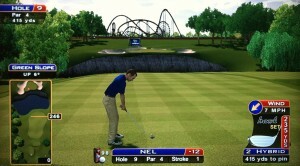 Here’s a slightly more challenging par 3 that may force you to deal with a hill on an elevated green. You can be on any of 4 tee boxes, so you’ll get lots of looks here. Remember to account for that slight rise in elevation, and err towards the middle of the green if the pin placement makes it hard to attack! Here’s a cleverly-designed hole that can get you in trouble if you’re not careful! 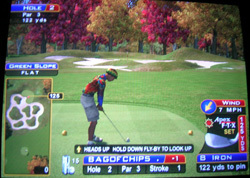 You’ll notice that the second fairway is elevated and guarded by a cliff. If you blindly select your driver and hit an A1 towards the second fairway, the cliff might catch your ball and shoot it into the water! 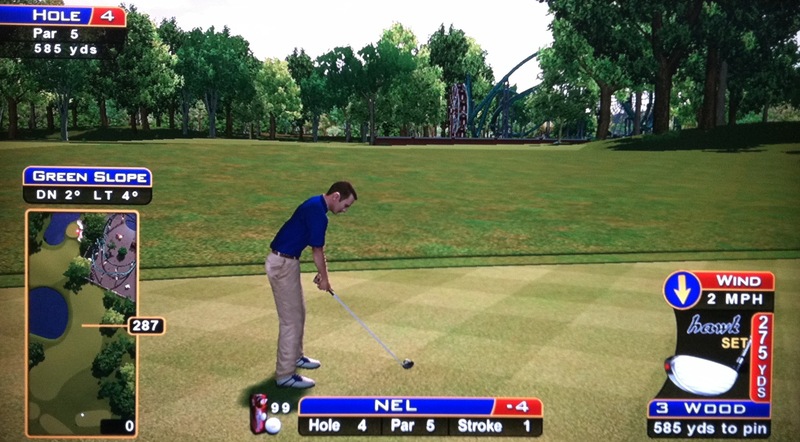 Instead, select a 3-wood off the tee. This club will always have enough elevation to clear that cliff with an A1, and you’ll have enough distance also. Any spot in the second fairway will offer you a nice approach shot for eagle, so the most important thing is hitting that fairway! Putting the right amount of cut on this shot can also be challenging, and you might find yourself in the sand or, even worse, the water on the right! I recommend NOT using backspin if the wind is blowing to the right, since you don’t want the ball being pulled more towards the water. And, if the wind is blowing left, you might want to hit a softer shot with backspin so you don’t carry into the left rough. Just do your best to land in the middle of that second fairway, and an easy eagle should be your reward! You’ll be using a vast array of clubs on this hole depending on your tee box placement and the wind! This green is always drivable, and you’ll usually use backspin to hold the green. The biggest danger here is the water if you go long, and it is pretty easy to miss long here too! Be most careful when the wind is blowing straight ahead or to the left, because these winds will carry an A1 shot out more towards that water than you would expect. In these cases, club down and play slightly more cut, using backspin to hold the green. Overwhelming consensus here is to aim right at the green and play a B1-type shot — much easier to control distance and accuracy both. Since this is a par 4, you should be happy with any kind of putt for eagle! Your first decision here will be whether or not you can clear the water, creating a shortcut to the green! Keep in mind that a really sharp cutting shot will skip off the water, so you can use that to your advantage if needed. If you have doubts about cutting the corner, then you should probably play an A1 driver with roll in order to get as far down the fairway as you can. The farther you go, the less you’ll have to deal with the tree guarding the left side of your approach shot. There will be cases where you will have to play a B3 or mini C3-type shot to get around that tree guarding the approach, and if this is necessary, make sure you play enough “3” to get around the tree and its leaves! This is a tough par 4, so birdie is a great score here! I had to hit driver-driver on this hole, but this great shot got the job done! Whether you like it or not, you’re going to have to do some math here. Take your distance to the hole and subtract 240 from it — that’s where you want your drive to end up. So let’s say it’s 410 to the hole. 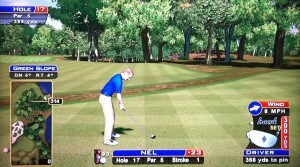 You want to hit your drive 170 yards and stick it there in the fairway. If you do so, you’re have 240 yards into this greatly-elevated green, and a 5-wood will be the perfect club for you! If you use the Big Berthas, you’ll have more flexibility if you want, because you can drive it farther and hit 7-wood into the green instead. The worst thing you can do on your approach shot is leave it short, and this will happen if you have to use a low-lofted club or don’t hit it hard enough. Now, you don’t have to hit it a lot harder on your approach — just a little bit. And if you’re 240 yards away, hitting a 250-yard 5-wood should be about perfect. Missing short will add at least 2 strokes to your score, since you’ll have to hit backwards again! The one exception to this could be if the pin is on the front edge of the green and the wind is in your face. In this case, I recommend leaving 230 yards in for your approach shot, because you’re going to want to aim for the back of the green with backspin that will really pull back towards that pin! Finally — this hole is sometimes drivable straight-on! With a good spot on the closest tee box and a tailwind, you can pound a B2 drive that should carry right up onto the green! Keep in mind that a low-loft driver might not work, but most 300-yard drivers can do it. Also keep in mind that backspin adds a slight bit more loft, so use that too if you can! AN ACE FROM THE TEE! 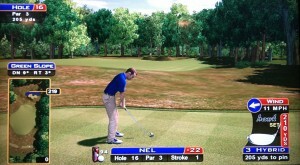 I’m not sure, but it looks like this hole has 1 tee box and 6 possible greens into which to shoot! Almost all of these greens have water and sand surrounding them, so it makes for a tough little par 3! Be careful with your low-lofted club here — you don’t want to end up short! You may need to play a small curve shot into the green to get the best results during a tough setup! 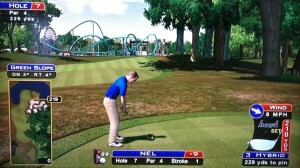 Here’s another creative par 4 that’s tougher than it seems! There are lots of tee boxes to keep you just unfamiliar enough that you’re guessing what to do your next time out. 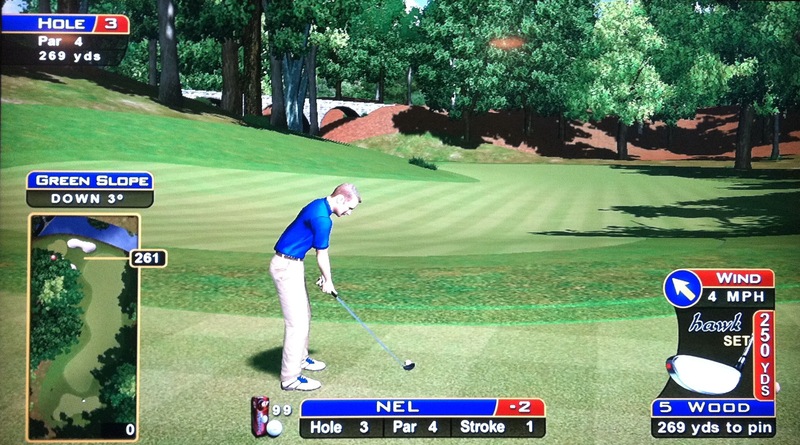 The ideal shot carries the lip of sand and lands right on the green, holding with backspin. This isn’t always so easy though, because that lip can block a low-lofted driver. If you can carry it with a 3-wood, you’re in good shape, but if not, you’ll have to decide if you want to try to carry it with a driver OR if you want to try to one-hop over the sand lip and hold the green! Obviously, the second option is hard to pull off, but sometimes it’s your only option. Of course, be very careful not to go long, as that’s wet! You’ll need practice getting the feel for when a driver can carry over and when it might not. This green is also tough to putt on, and be very careful if you have to putt downhill towards the water! From the back right tees, there’s a nice shortcut over the lake if you play a C3 shot! It’s not always there and is tricky — you have to make sure you miss the tree right in front of you, and you have to make sure you’ve got enough power to clear the lake and bounce up towards the green. If you’re pinned on the left side, you can cut the corner by ramming a driver through the trees, which will trickle into the fairway. Usually, it’s not worth this risk. Instead, just play it out in the fairway, but be long enough to avoid the tree guarding the right side of your pending approach shot! 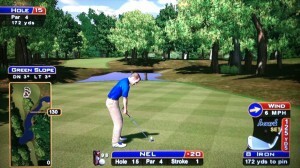 This par 5 offers multiple shortcut options! If you’re back and left, you’ll notice a landing area just over the lake that’s about 200 yards from the hole. The problem is that you won’t be able to take dead aim at this spot. 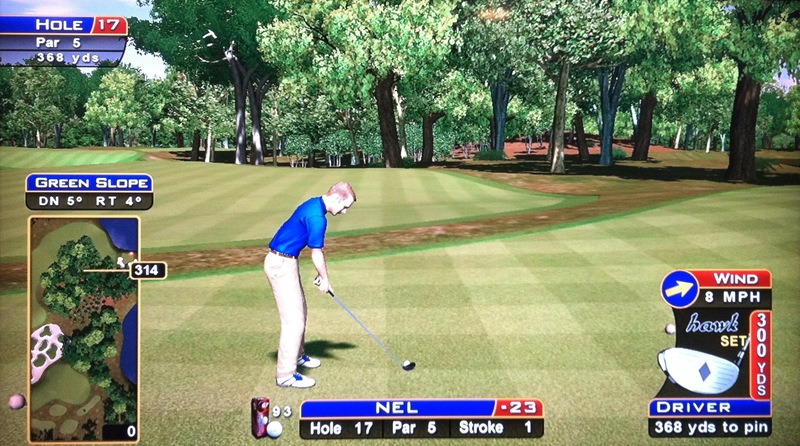 Instead, you’ll have to hit an A1 around some trees and over the lake, and then it’s hard to get the ball to stop, especially if you may need to skip across the water. The ideal spot on this patch is as far back as you can get, because a 5-wood will clear the trees from the back. 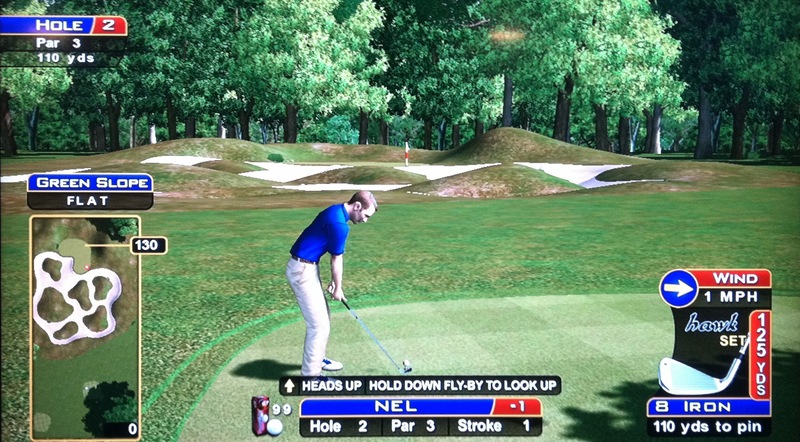 If you’re too far up, you’ll have to do your best to punch a shot through the trees instead. Another time to consider this landing area is from the front tee box with a wind in your face, so you’ll play a C3-type shot with backspin and curve into the landing spot that way. 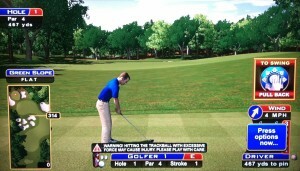 This gives you a much better chance to stay far back enough to pop the 5-wood over the trees. Most of the time, you’ll want to play a big A1 with roll across the lake straight ahead. The farther down the fairway you get, the better, because that’s where the gaps in the trees open up! If you don’t get very far down the fairway over the water, you can take a low-lofted club and hit a 1/2 to 3/4 shot under the trees to the green. If you do get really far down and really close to the trees, you might find yourself in a spot where you actually have a clear 7-iron under the trees into the green! It’s a fun hole that can reward you with an eagle putt if you can work a shot through the trees on your approach! This hole is really tough. You can rarely clear the lake to the fairway on the other side — you need a great wind and a big A1 with roll, and probably a skip, to pull it off. Instead, you’re probably going to be laying up in the fairway right in front of the sand. From here, you should have about 250 yards and a 5-wood into the green, but it still won’t be a clear shot. 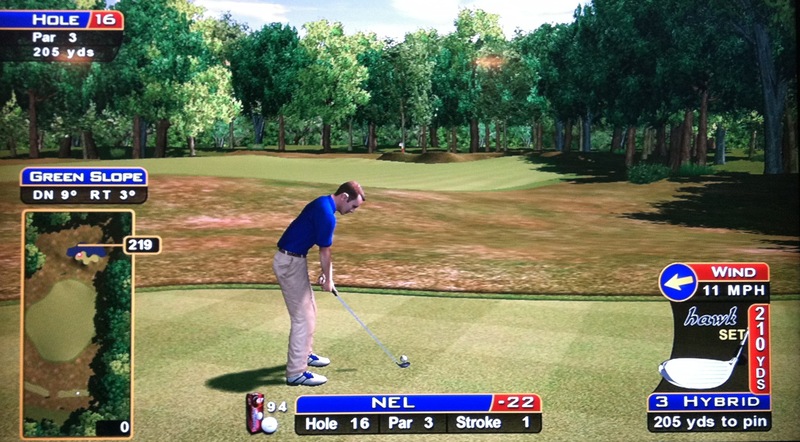 You’ll have to play a small C3-type hook into this green, and keep in mind that this will cut a bit of distance off your shot too. Whether or not you use backspin will be up to the wind and pin placement, but make sure you aren’t short, because that’s wet! 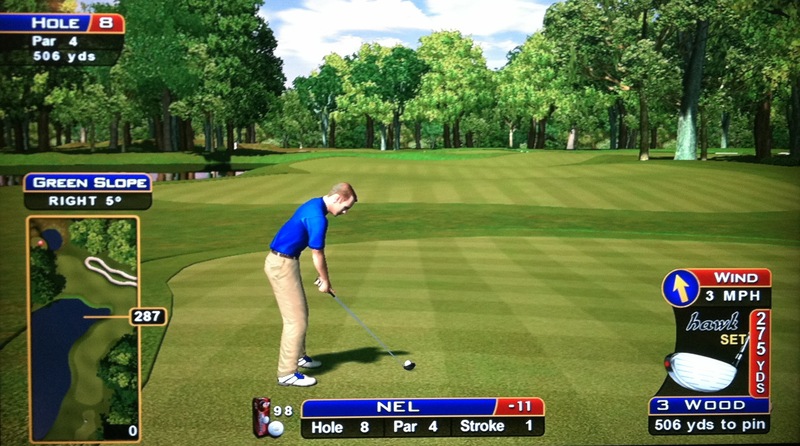 If you’re too far back on the tee box, you can pretty much forget about hitting the green in one. Depending on the wind, you can either hit it long and straight, or cut the corner to the right of the trees on the other side of the lake, leaving you a shorter shot into the green in two. The approach shot from here is still really tough, because the wind is going to blow a wedge a LOT, and there’s no room for error with water surrounding this green. Pin placement can be awful too. If you’re in the middle or front of the box, you can test your bravery by playing an A2 or A1-type shot around the trees into the green! The type of shot depends on the loft of your club and the wind. If you’re finessing a 5-wood, you’re probably planning to carry the green and use backspin, but you still need to hug the trees close without nipping a leaf. If you’re playing a low-lofted club, you have the option of landing short in the rough and letting the ball roll up onto the green. Finally, sometimes there’s a tee box with a bit of an opening in the trees that allows you to pound a driver straight at the green. All of these shots are really difficult and require a lot of practice to pull off, but give it a try if it’s not going to kill a great round for you! Think it’s got to get easier? Think again! 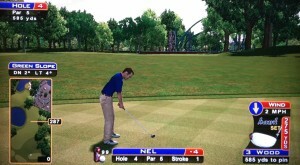 Here’s a really tough par 3 that can burn you in a bunch of ways. Your attack plan depends on the wind, but you’ll always be shooting into a green that slopes 10 degrees towards the water in back. 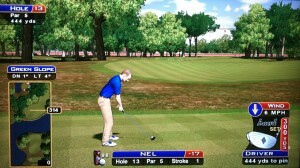 If the wind is in your face, it’s a bit easier, because then you can plan to carry the green and stick it with backspin. If the wind is at your back, you might have to get creative. Often times the best shot is a low-lofted iron with backspin that lands short of the green but hops up onto it. If you try to carry this club, the wind may push it all the way to the water, or backspin might not be enough to hold the green either. Still, landing short and bouncing up is really tough too, as you’ll notice the different slopes and angles as the rough rises up to the elevated green. 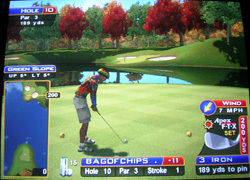 If you’re short, you’ll have a tough chip depending on the pin placement, and you have to be careful. 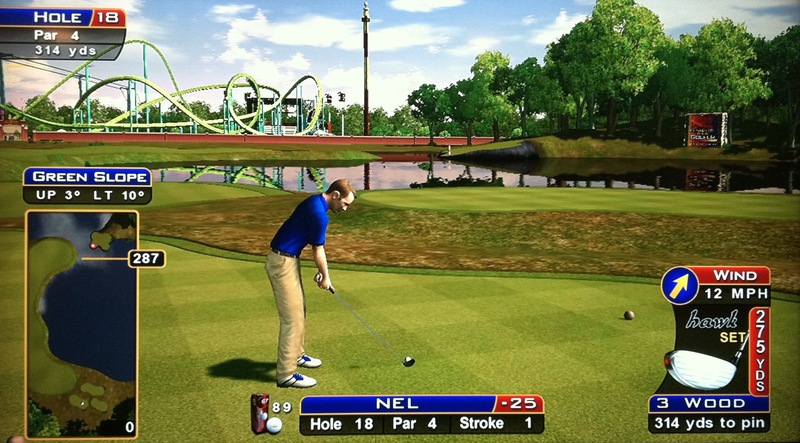 Even when you’re on the green, a downhill putt is incredibly dangerous since, if you miss, you’re in the water there too! There are three ways to get there in two. First is the traditional route, following the fairway on around. If you’re got a nice wind helping you out (blowing to the right), this may be your best chance of landing the green in two. Get your drive out there as far as you can, and you’ll be left with a manageable A1 into the green in two. This shot will still test your accuracy as left is water and right is sand! The second, and by far most popular, way is the shortcut through the trees! Locate a patch of short trees growing in the midst of the forest, and try to land in here somewhere towards the end of the patch. In general, hit it as far and as right as you can, which is usually a 3-wood A1 off the tee, because there is much more clearing the farther you go. You just might find yourself able to punch a low-lofted iron with backspin towards the green, and if you control the distance, you’ll have an eagle putt! Finally, there are island patches of green in the middle of the trap straight ahead. If you can hold one of these, you may have a shot with a driver or a 3-wood into the green, but the trees can definitely interfere with that approach shot as well! Rumor has it that some pros have driven the green on this hole — I think with a low-loft driver C3 shot from the far right box! THE SHORTCUT THROUGH THE TREES! HERE IT IS — SUPER ALBATROSS! AMAZING! Sick of these island greens yet? Don’t worry — this is the last one! Sunny Wood finishes with a drivable par 4, but if you miss the green, par will be tough to achieve. 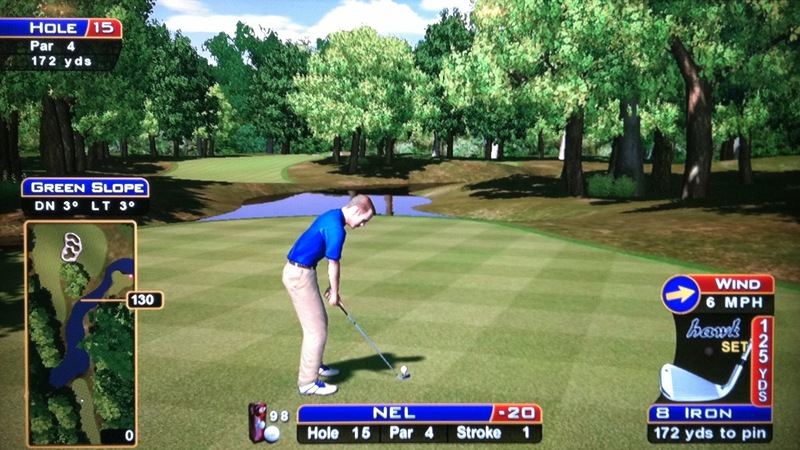 As with most of the drivable par 4s, you’ll have an offset look, so you’ll have to make sure you pull back at the correct angle and most likely shoot forward at the same angle, using the 180-degree rule to maintain distance and keep a straight shot. You’ll use anything from a driver to 5-wood here, and the green slopes up but also severely left towards the water. Above all else, your goal is to stick the green, and the best way to do this is to land your shot up high and right and use backspin to pull it back down towards the middle. Once again, be careful of downhill putts where the penalty for a miss is water! UNBELIEVABLE — ONE OF THE BEST SHOTS EVER! !